We think this is an intriguing take on half-tone art. 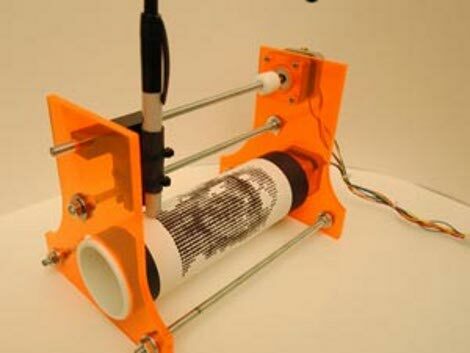 It’s a CNC machine that uses an Arduino and two stepper motors to draw on a paper-covered drum. But you’re not just going to set it and forget it. To simplify the device, the Z-axis is not mechanized, but requires the dexterous opposing digit of a person to actuate. The first prototype used a frame cut from plywood, but the developers moved to some attractive laser-cut Lexan for the final version. The rotating drum was inspired by observing the off-set printing process. It greatly simplifies the build when compared to a flat CNC bed. But including a Z-axis solution that could account for differently sized dots really opens a can of worms. Because of this, the choice was made not to automate that task, but to leave it up to the user. A clickable Sharpie does the marking. When the pen is in place, you click the plunger to hold the felt tip against the paper until a dot of the appropriate size has leeched onto the paper. It’s not a bad solution to the problem. Especially if you don’t have the high-end milling equipment necessary to do this on a piece of plywood. This Pong game is so small (translated), you’ll be fighting over who gets a closer view of the screen. [Christian] made a bunch of halftone pictures with a CNC mill. 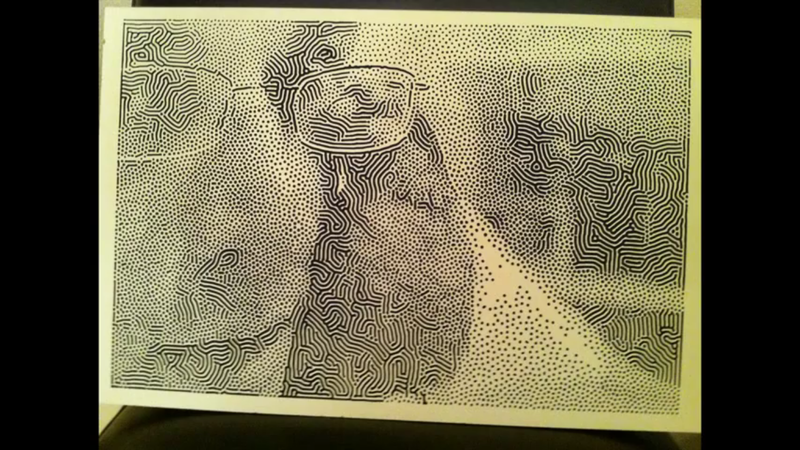 He took the concept from [Metalfusion’s] halftone projects and ran with it. He even posted some video of the machining process (turn down your sound before viewing this one). [Jumbleview’s] take on the most useless machine makes the entire lid shut off this rocker switch, instead of using a separate arm for the task. [Noel] is using a couple of 7400 chips in an unorthodox way to form a full-wave rectifier. They’re not powered, but instead used for the internal diodes. It’s his entry in the 7400 contest. [Metalfusion], built himself a nice looking CNC machine and has been experimenting with some out of the box uses for his new tool. One novel use he is particularly fond of is creating pictures with his machine (Google Translation). While you might imagine that he is simply using the CNC as an engraver, literally drawing images on the surface of his workpiece, what he is doing is far more interesting. He developed a small application that takes an image (jpeg, gif, or png) and converts it to a set of pixels, which can then be tweaked and skewed to his liking. The application exports the halftone image to a DXF file which can be fed into the CAD application that he uses to control his CNC machine. 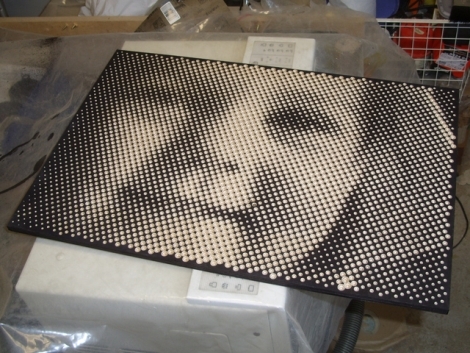 The CNC does the rest, using a v-shaped router bit to cut holes into his workpiece, generating a physical halftone picture from his digital image. Thought the process does take some time to complete, the resulting images are well worth it. If you are interested in trying this at home using your own CNC machine, the DXF Halftone application is available on his site for free. 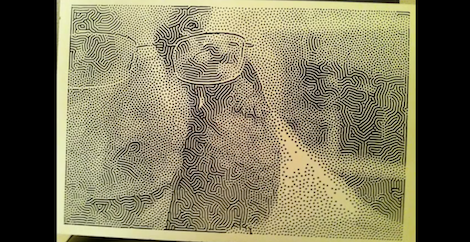 Continue reading to see his halftone generating CNC in action.